Pumpkin Seeds and Nuts Energy ladoo / Energy balls can be made with or without added sugars. These are easy to make, simple and healthy and is very nutritious. Pumpkin seeds (yellow pumpkin seeds, NOT ashgourd seeds) also known as Pepitas, are good sources of magnesium, pottasium and zinc. They aid in lowering cholestrol, promote good prostate and helps in boosting metabolism. They are loaded with Omega 3 fatty acids and the antioxidants found in pumpkin seeds assist in maintaining blood sugar levels and is helpful in preventing complications of diabetes. It is also helpful in menstrual disorders and insomnia. Though available, these seeds are bit costly in India. My son sent me these from U.S. Recently, I received a Turbo chopper from Preethi Kitchen Appliances. 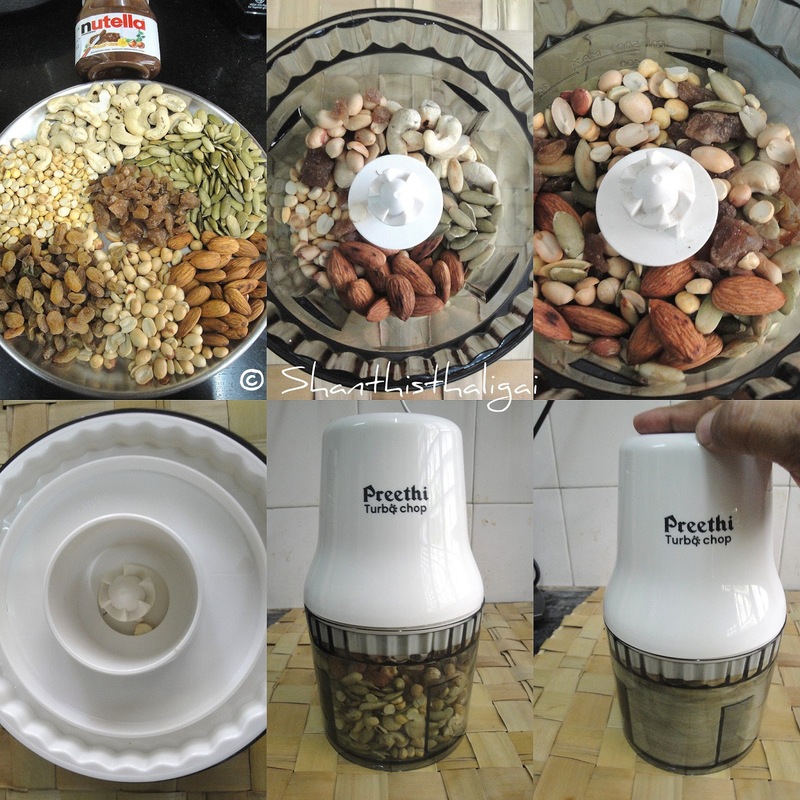 Preethi Turbo chopper is an easy to use, handy equipment used for chopping onions, cabbage, greens and nuts. Dips and chutneys with tomatoes, herbs, etc. can also be made with this small chopper. It just needs one press and does its job fast. 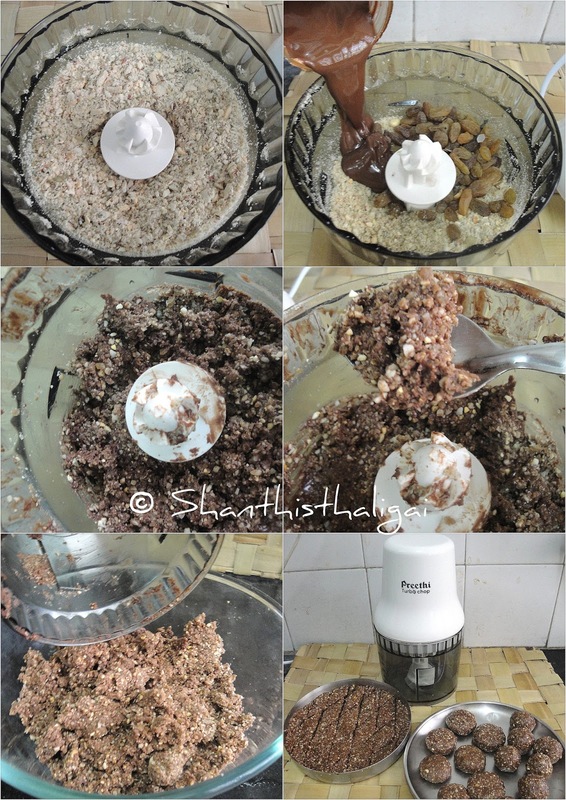 I have used this Turbo chop for making this energy ladoos. You can also use a dry mixer jar. Dry roast pumpkin seeds, cashews, almond, peanuts and roasted gram separately, on low heat until hot. If kept in fridge, bring to room temperature and then dry roast. When cool, grind along with palm candy to a coarse powder. Now add raisins, honey and nutella, whip until mixed well. Transfer the mixture to a bowl. Grease hands with ghee and shape to balls, pedas, or squares. If cutting like square, transfer to a tray, press the surface evenly with a greased cup and cut into desired shape.